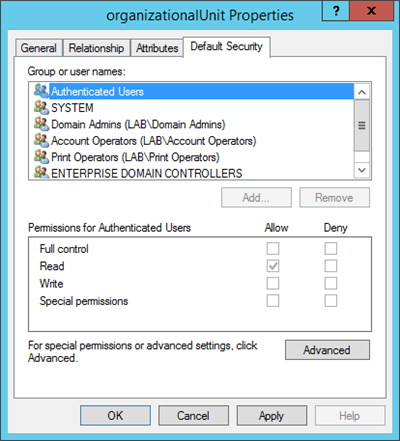 A common requirement is to limit what a user or group of users can see in Active Directory. One possible solution is to deny “List Contents” on OUs or the root of the domain itself to stop users from displaying possible sensitive information (see Controlling Object Visibility – Deny List Content). Keep in mind that this option is going to be an explicit deny, accounts that need access to or that need the ability to look-up other objects in the domain could be blocked from doing so. 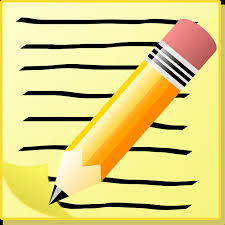 An alternate solution to denying "List Contents" is to enable "List Object Mode". 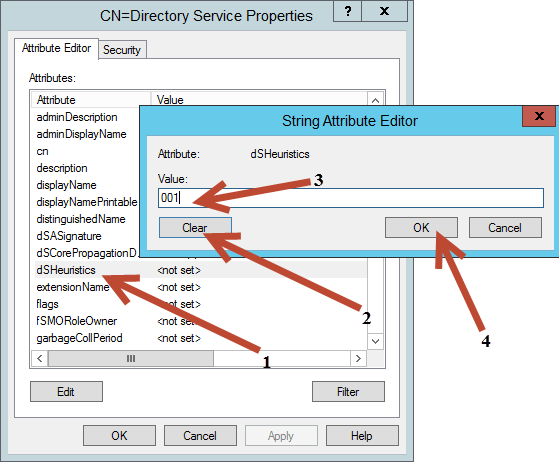 This alternate, list object mode, solution doesn't immediately have the same affect or ramifications as an explicit deny might, but it does require modifications to the schema and permissions need to be removed from the AD DS implementations current OU structure. The test cases below are derived from the article found above, Controlling Object Visibility – Deny List Content. Rather than create separate test cases for this solution, these cases closely resemble the test cases from the previous article so readers can have a closer comparison and make a more informed choice when picking the solution, or solutions, that best fits they organizational needs. These cases have been modified slightly and precede the original test case from the "Controlling Object visibility – Deny List Content" WIKI article. The reason these comparisons are made is so the reader can see and understand the verbiage differences between the test cases from each article/solution. 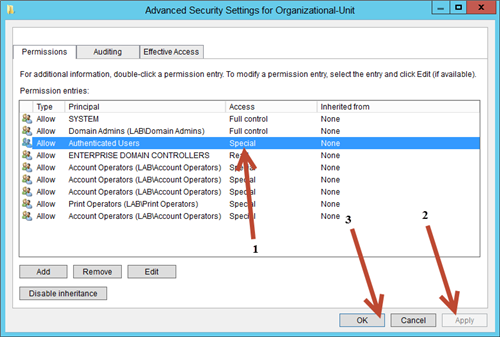 The methods for controlling object visibility in Active Directory by using "Deny List Contents" vs. "List Object Mode" can give administrators two separate outcomes when limiting what users can see. Those situations and their differences will be differentiated in this article so that the differences between each solution are clear. As with any solution, make sure you test the solution's scope to determine what may be affected when you move this from a development implementation to a production implementation. Below is a link to a Directory Services forum post on TechNet, a user asked a question that revolved around the need to limit access to Organizational Units. 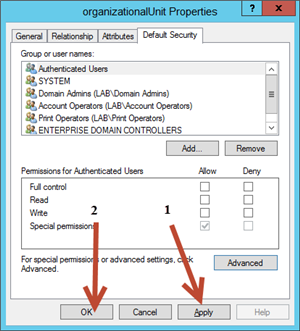 This second WIKI article aims to help by showing, in detailed step-by-step instruction, an alternative solution to denying list contents and how this can be accomplished by enabling "List Object Mode" in Active Directory. This is an alternative solution that some administrators may find useful. 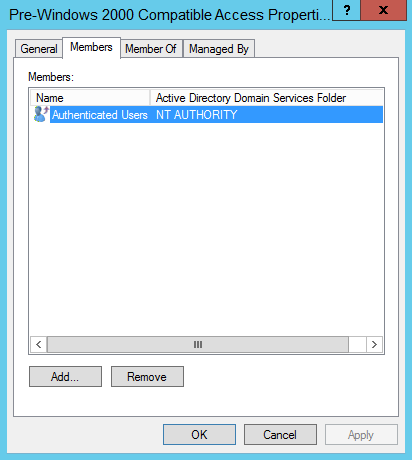 How to config a trusting domain so that domain admins in the trusted domain can only see users in a certain OU in the trusting domain? 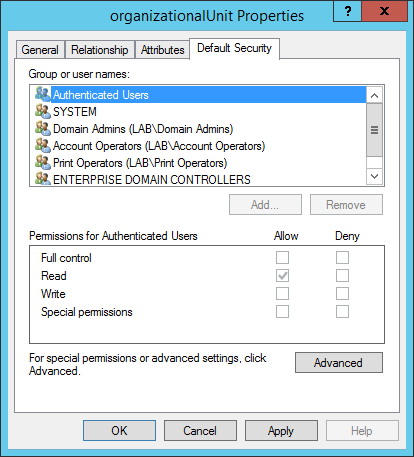 Domain Administrators from the Lab-Forest-2.Local domain need their access restricted so that they are not able to view the structure of the Lab.Local forest. Domain Administrators from the Lab-Forest-2.Local domain need to be denied access to view all the contents of Lab.Local. 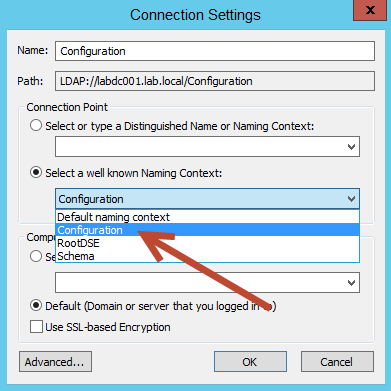 When you make changes to the schema and ACLs in Active Directory, you run the risk of doing serious damage to your AD DS implementation and applications that depend upon AD DS to access the information and objects contained within. I warn you from experience and it is in no way meant to stop you from undertaking the changes outlined here. 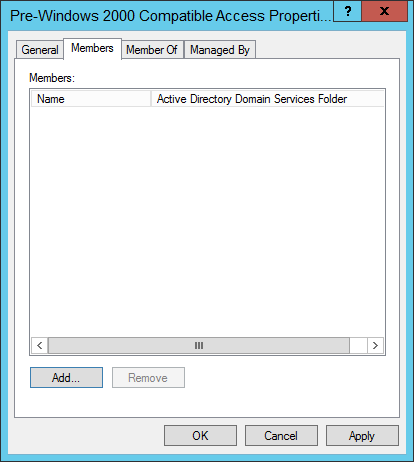 Any change to Active Directory, done correctly, can provide you and your organization with added benefits. Always, always, always make these changes in a development environment where you can test as many aspects as you can before making them in a production AD implementation. 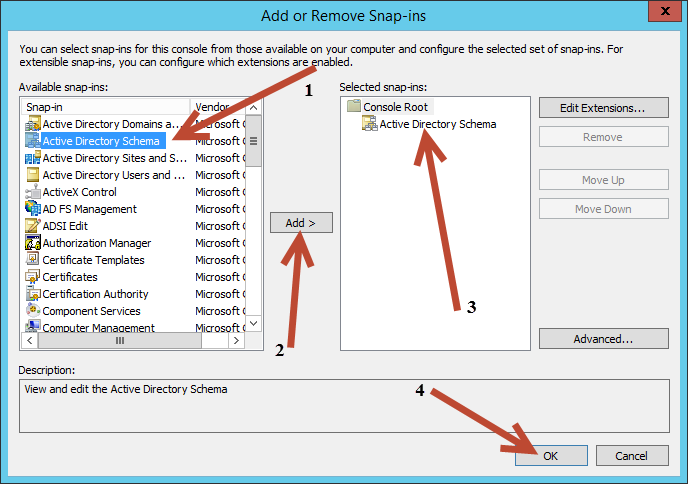 Note: To register the Schema snap-in and to make changes to the Schema will require elevated rights. 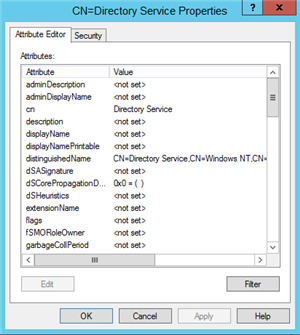 Domain Admin rights will be needed to register the schema dll and Schema Admin rights will be needed to modify the schema. Check the account being used to ensure it is a member of the aforementioned groups so that the account will have the appropriate rights to complete the steps outlined below. 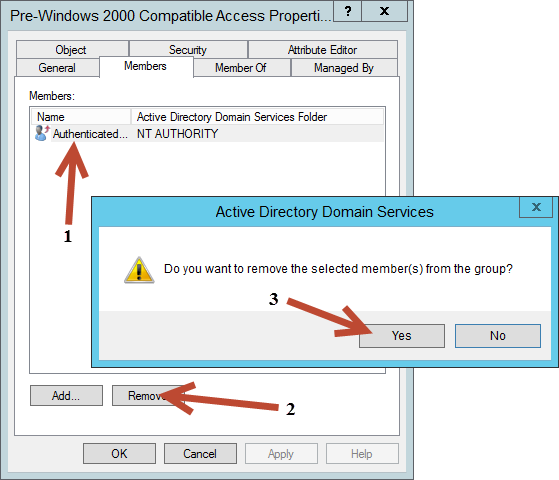 By default, the Authenticated Users group is a member of the Pre-Windows 2000 Compatible Access group, because of this it will need to be removed. 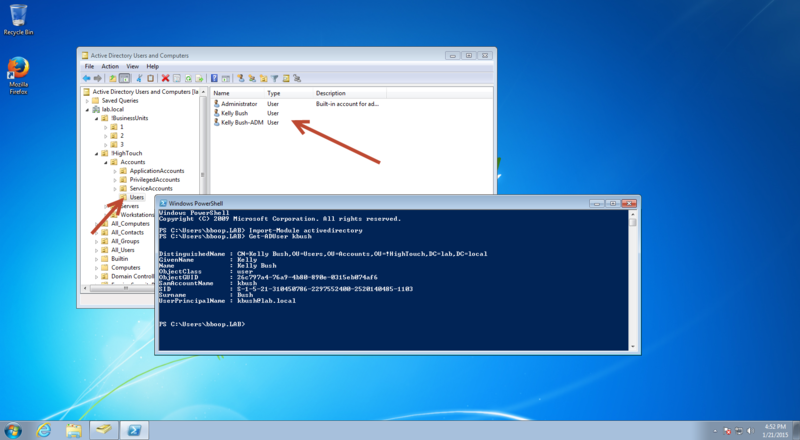 The Pre-Windows 2000 Compatible Access group is meant for, and left around for, NT 4 compatibility and the days of Active Directory in Windows 2000 and 2003 when more NT systems were still in use. You remove this group just like you would any other user or nested group. As you can see from the image below, Authenticated Users is nested in Pre-Windows 2000 Compatible Access. That successfully completes this step in removing the Authenticated Users group from the Pre-Windows 2000 Compatible Access group. 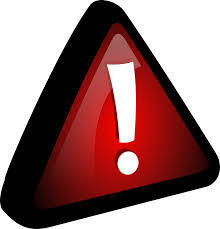 Stop: Making modifications in or to the schema can cause serious or fatal problems to your AD DS implementation. 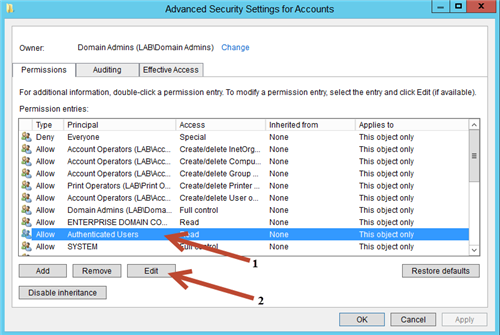 Make sure you have a current backup of your AD DS environment, as well as documented and tested restore plans/procedures. As always, before making any change to a production environment, make sure you've fully tested and understand the actions you are about to take. Test these actions in a controlled development environment before making them in production. The DS-Heuristics attribute in AD DS can be used to make global changes to the behavior of Active Directory and Active Directory controllers throughout the entire Active Directory forest. Making this change is a forest wide change. 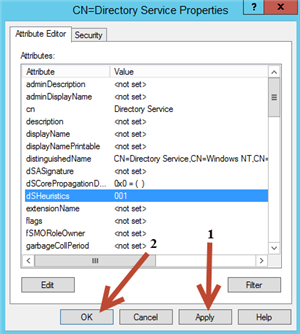 The first step to putting Active Directory into "List Object Mode", is to modify the dSHeuristics attribute and set the third character to 1. This is done through ADSI Edit by connecting to the Configuration context. 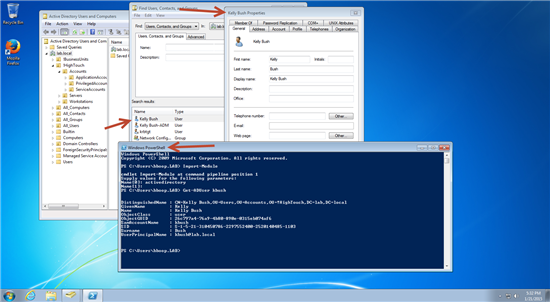 Open ADSI Edit from either Administrative Tools, a new MMC, or by typing adsiedit.msc and pressing ENTER at a command or PowerShell prompt. Once open, right-click ADSI Edit in the left column and select "Connect to..." as shown below. After selecting "Connect to...", the Connection Settings dialog box will appear. 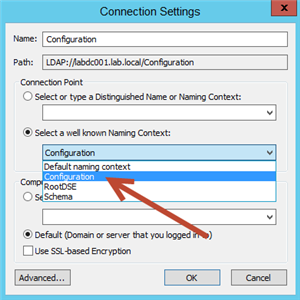 In this dialog box, select Configuration from "Select a well known Naming Context" and then click OK. See the image below as reference. See the image below for details on the steps above. 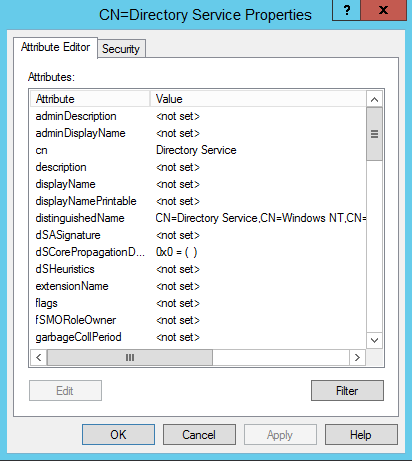 After completing the steps above, the CN=Directory Services Properties dialog box will appear as can be seen in the image below. To finish enabling "List Object Mode"
After this short list bit of work has been completed you can close ADSI Edit, you've know enabled "List Object Mode" and are ready to proceed. 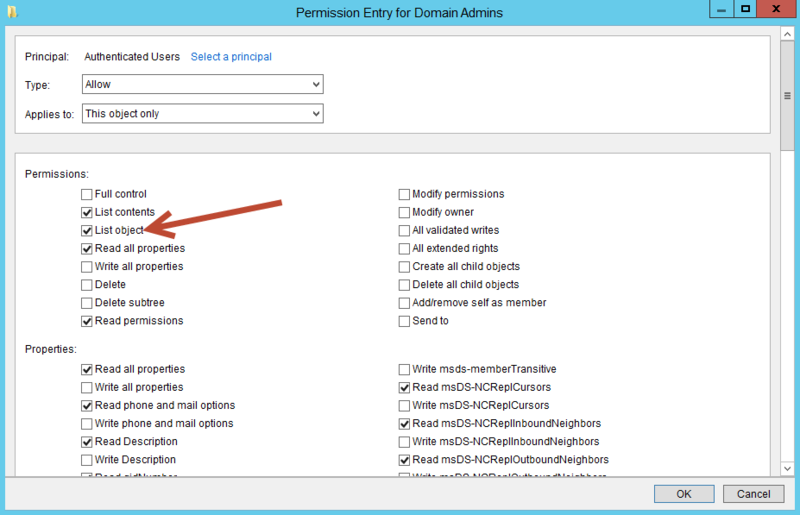 This will open the "Permission Entry for Domain Admins" dialog box and the Principal should be Authenticated Users (upper left corner), under Permissions you should see the newly listed permission "List object". 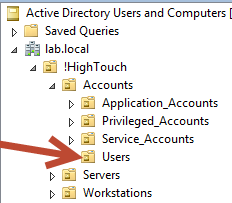 To keep in line with Test Case 1 and hiding the Users OU, which is nested under Accounts -> !HighTouch -> Lab.local, we need to first remove the "List content" permission for Authenticated Users on the Accounts OU. Open Active Directory Users and Computers and find, then select and right-click the parent OU you wish to modify (in this case, the Accounts OU). 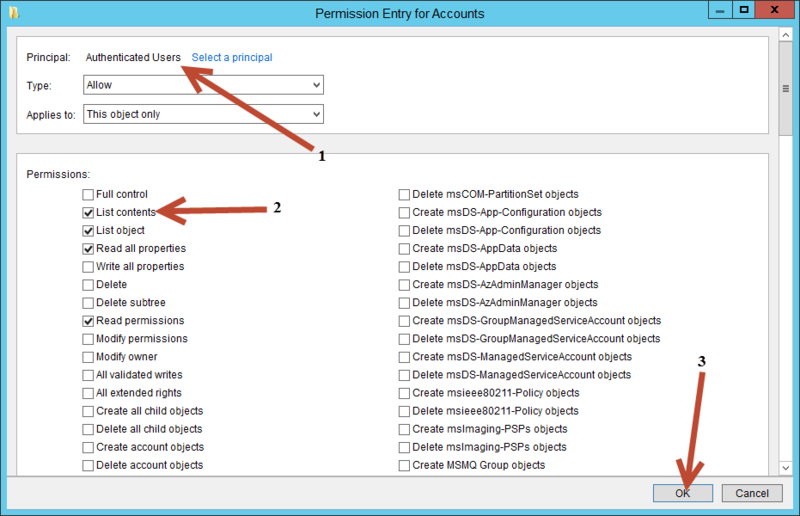 Once this is completed the Permission Entry of Accounts dialog will appear. 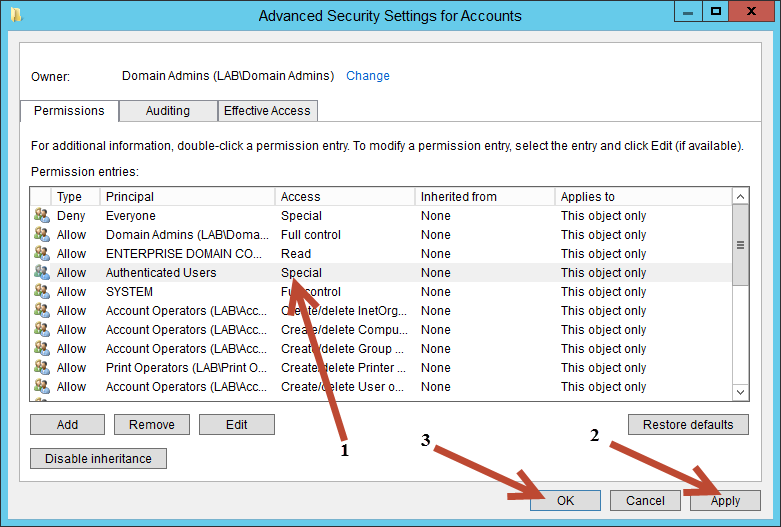 When this step is completed, the Permission Entry for Accounts (or the OU select in your environment) dialog will close and the system will bring you to the Advanced Security Settings for Accounts dialog. After verifying, clicking Apply and then clicking OK, the dialog box will close and you will be left with the Properties dialog box for the OU you are modifying. Click OK to close this last dialog box and you will have successfully completed this step. 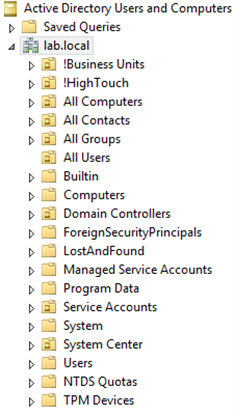 On a Windows 7 machine I have RSAT installed and have opened Active Directory Users and Computers to verify that I can still see the Users OU and the objects it contains. After completing the previous steps and having removed the "List contents" permission from Authenticated Users on the parent OU (in this case, the Accounts OU), we can now move ahead and remove the "List object" permission from Authenticated Users group on the child OU. This is the OU Betty Boop and other users within the organization should not have access to see. Open Active Directory Users and Computers and find, then select and right-click the child OU you wish to modify (in this case, the Users OU). 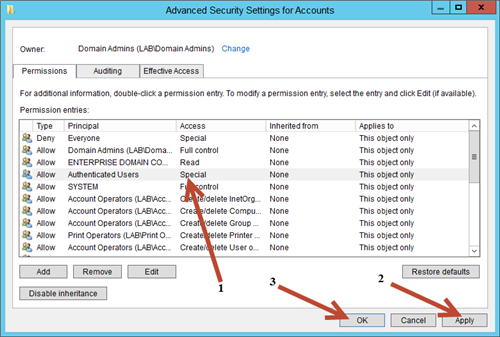 When this step is completed, the Permission Entry of Accounts dialog will close and the system will bring you to the Advanced Security Settings for Accounts dialog. After verifying, clicking Apply and then clicking OK, the dialog box will close and you will be left with the Properties dialog box for the OU. Click OK to close this last dialog box and you will have successfully completed this step. When this is completed, these steps will have hidden the child OU. 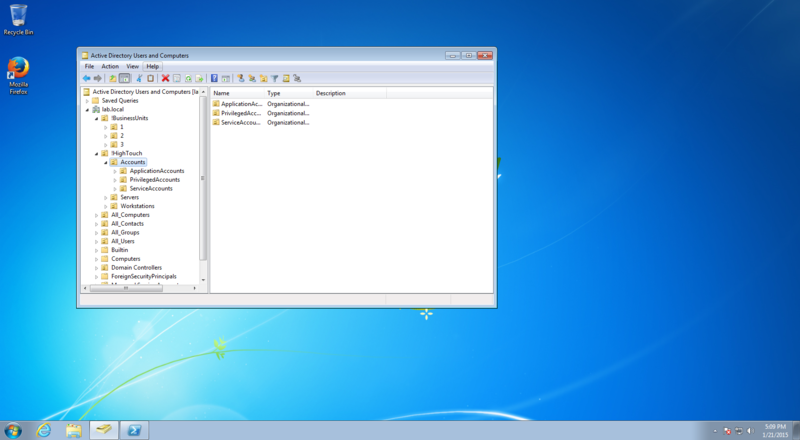 Going back to the Windows 7 machine with RSAT installed, in Active Directory Users and Computers select the parent OU (in this case, the Accounts OU) and PRESS the F5 key to refresh the contents of the OU. After refreshing the contents of the parent OU verify that the child OU, the Users OU, is NOT visible. If everything worked as planned, the child OU should NOT be visible to regular Authenticated Users as the image above shows. So you're probably thinking this is awesome, now regular users cannot see the OU structure of the organization. This is a true statement... However, under the current settings, in this situation as it is currently, the Authenticated Users group has had the ability to view the child OU in Active Directory Users and Computers removed. This does not stop Authenticated Users from still finding those sensitive users in your environment. 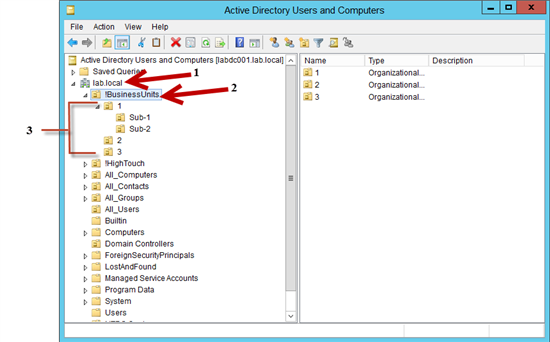 In the image below, notice that in Active Directory Users and Computers the Users OU is not visible. 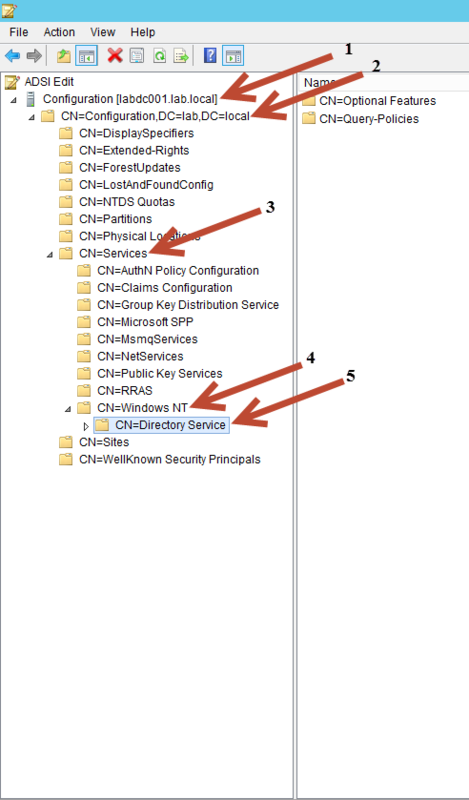 However, if you look at Find Users, Contacts, and Groups as well as PowerShell, both places allow Betty Boop (Authenticated Users) to search and find the user accounts that were in the hidden by hiding the child OU. 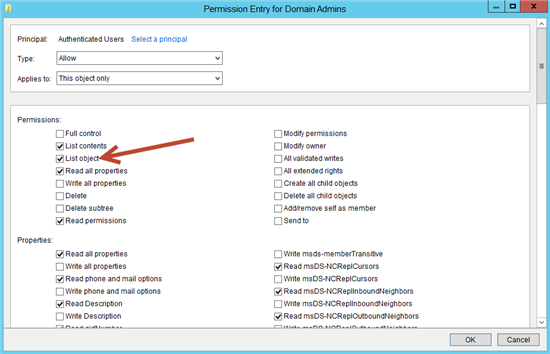 To take this a step further, you have to remove the List Content permissions from the child OU as well. If you were wondering why I didn't include this as part of the steps in previous sections, here is the reason. 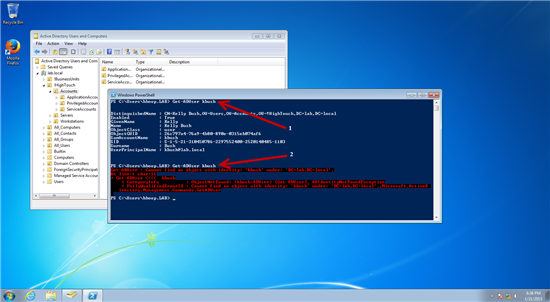 If you remove "List Content" from the parent OU and then remove both "List object" and "List contents" from the child OU, you will not be able to look up the users with Find or PowerShell. By removing both "List object" and "List contents", you have essentially created the same thing that deny "List contents" had done. In the image below, Arrow 1 points to the PowerShell Get-ADUser command before "List contents" was removed from the child OU and Arrow 2 points to the same command after "List contents" was removed from the child OU. To recap, if both "List object" and "List contents" are removed from a child OU whose parent OU has "List contents" removed, you run the risk of denying applications, that rely on user accounts in an AD DS environment, the ability to look-up information in the domain. For Test Case 2 we run into a problem based on the work we did above. With the current setup the two domain trust each other by a 2-way trust and have Forest-wide authentication. Because of this Forest-wide authentication, you would have to modify the root of the domain and take away "List contents" for the Authenticated Users group. After that, you would have to take away "List Object" on all first level OUs and containers. This works but what if you have an OU structure where the parent OU has "List content" removed? 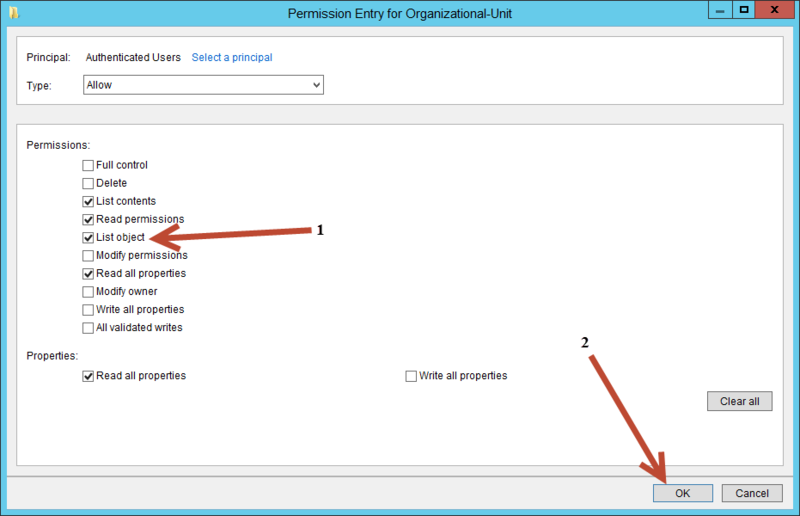 This would cause all Authenticated Users to be denied access to the objects in that OU, it's the same outcome as removing list content and list object from the section above. Active Directory is very flexible out of the box and you can delegate and manage permissions to fit the needs of your organization. However, to many changes, to quickly, untested, and out of proper change control can cause you hours, days, or an eternity of headaches. Always make changes in a controlled setting and never make changes directly to a production AD DS implementation. Remember, this article walks you through setting up "List Object Mode", this may not be appropriate in all situations as was outlined in Test Case 2 & List Object Mode. For your organization "List Object Mode" maybe useful or the use of a deny rule may be better suited, for your organization it may be a combination of the two. Which ever option works best for you is what is best for your organization. Note: This schema modification is NOT a mandatory step or requirement. 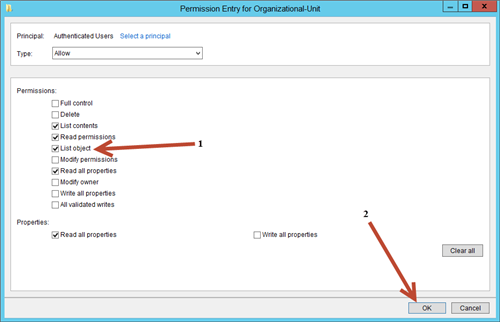 This step gives you the instructions needed to modify the default permission set of the Organization Unit class. 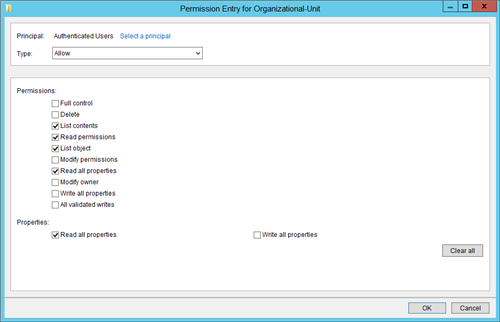 By modifying the default permission set of the Organizational Unit class, you can reduce the steps required when creating new Organizational Units in the future. By using the steps below to modify the Organizational Unit class, you modify the default permission set for OUs from the current default set to a new default set that does not include "List object" on Authenticated Users. 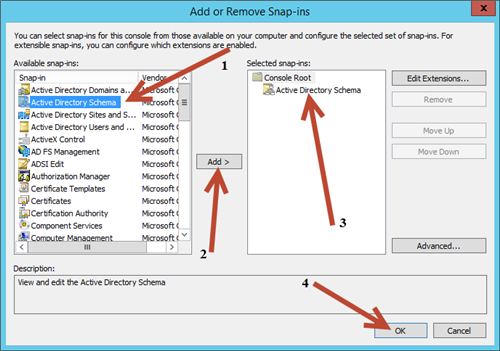 The following steps will show how to install the schema snap-in and modify the OU class step-by-step. 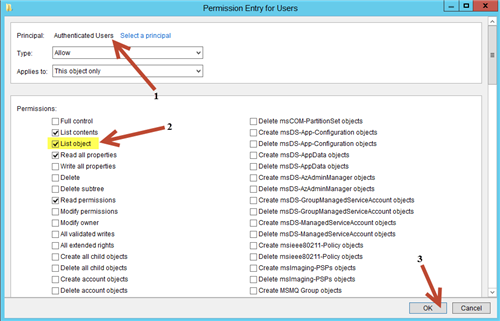 Once modified, any newly created OU will have this modified default permission set associated to it. To take full advantage of this step, all newly created OUs would need to be under a parent OU that has the "List content" permission removed for Authenticated users. 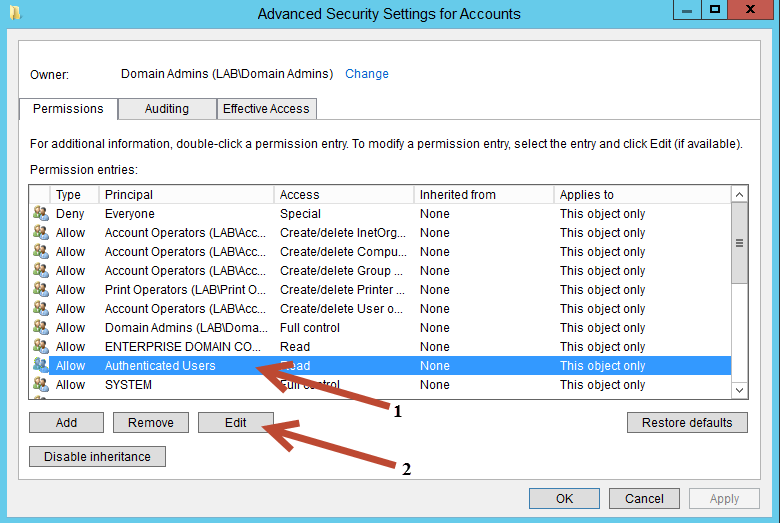 This option may be best suited for a hosting type environment but could apply to other organizations as well. See the below for a visual representation and further explanation. In the image above 1's represent parent OUs and 2's represent child OUs. 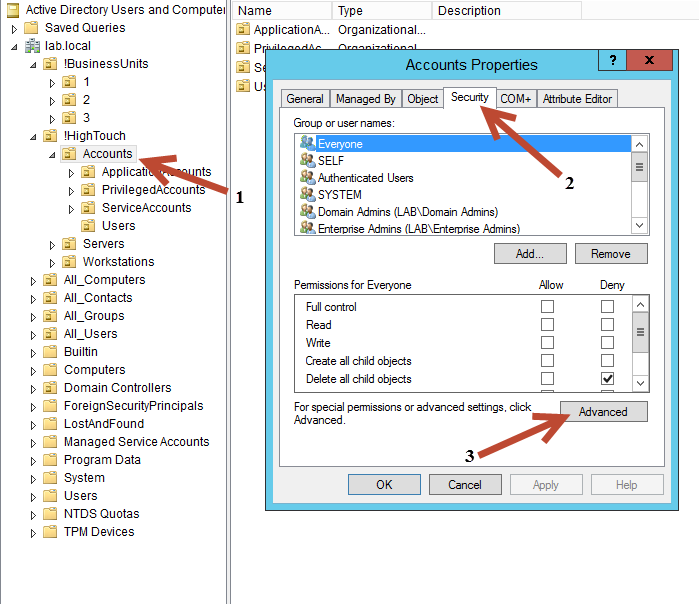 For the steps in this section to work, for newly created child OUs to be automatically hidden from the users view, the parent OU will need to be modified and the Authenticated Users group will need to have "List Content" removed from the permissions list. In the scenario above, the child OUs, marked as 2, would still be visible to the user community. If under !BusinessUnits a 4th business unit OU was created named 4, it would be automatically hidden from all authenticated users, assuming the parent OU security was modified and the steps below are followed. 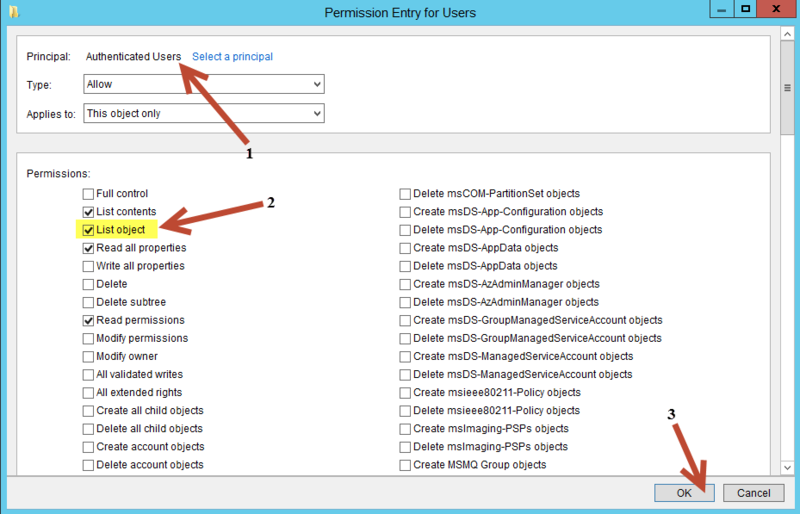 To modify existing child OUs, the "list object" permission would need to be removed and this step repeated for each OU that needs to be hidden from users. 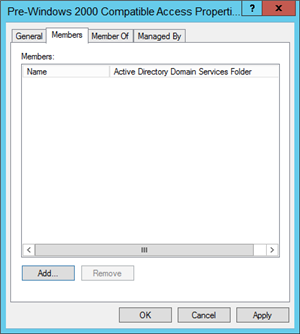 Membership in Domain Admins is the least required domain membership to complete this task. 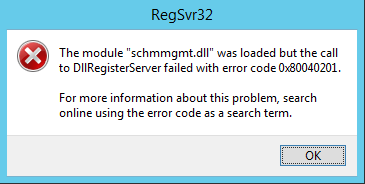 If you receive the error message above, it is a good chance you either did not open the prompt with administrative privileges or the account being used does not have the appropriate permissions to register the dll. 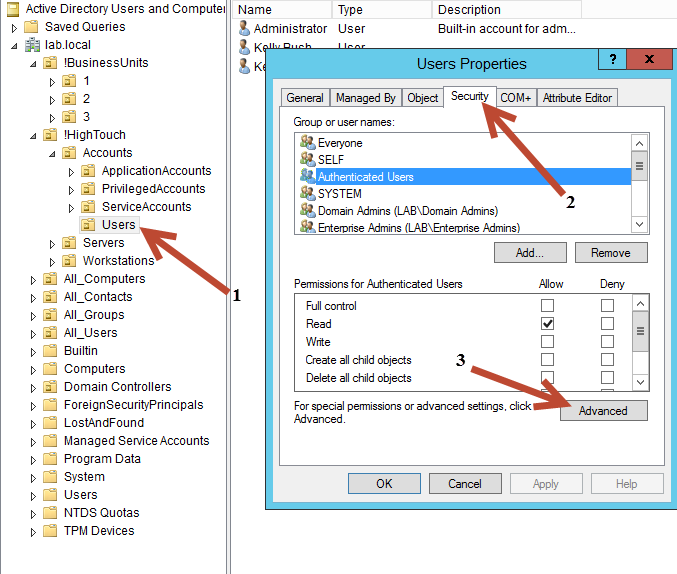 Check the permissions of the account you are using to complete the above step, reopen the prompt of your choice by right-clicking the prompt and selecting "Run as administrator", and run the command again. 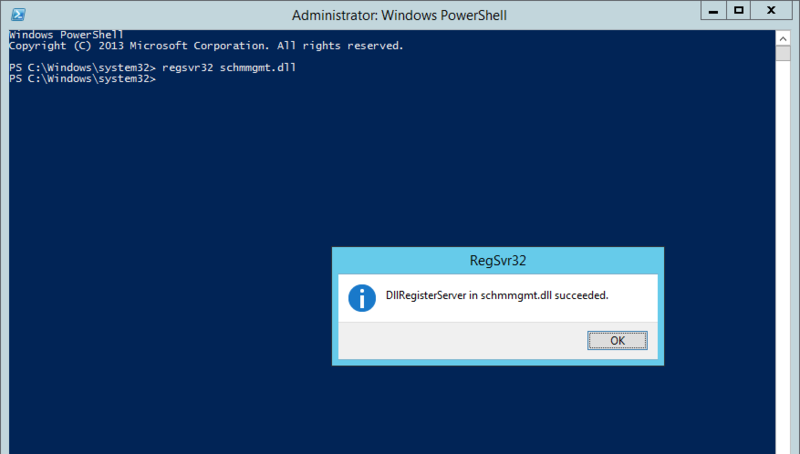 When the command completes successfully, you'll receive a message stating the schmmgmt.dll successfully registered, see the image above. 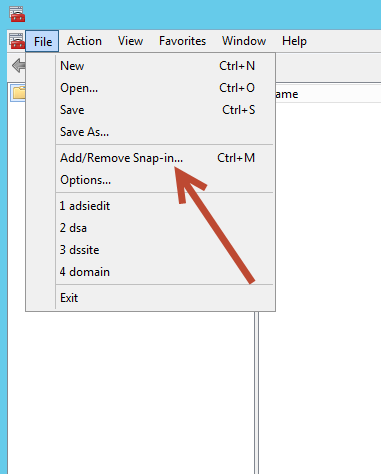 After you have successfully registered the schema snap-in dll, open a Microsoft Management Console (MMC) and click File, then click Add/Remove Snap-in. Then finish by clicking OK in the bottom right of the dialog window. See the image below for visual clarification on the previous 4 steps. Now that the Schema snap-in has been loaded into the MMC you can find and modify the organizationalUnit class. 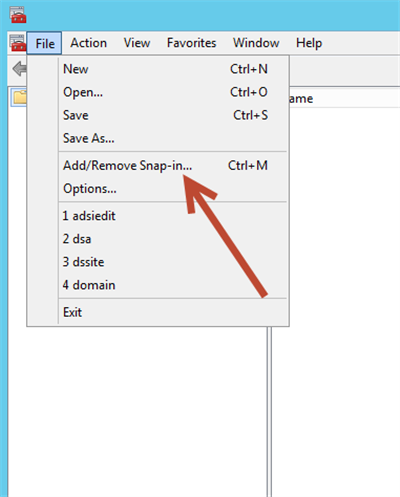 After the Schema snap-in is open, use the following steps to find the Organizational Unit class. See the image below for visual clarification on the previous 5 steps. When the organizationalUnit properties have been opened and the Default Security tab selected, the default security rights of Organizational Units will be present. Notice in the picture above that the Authenticated users group, by default, will have Read permissions on every OU that is created. 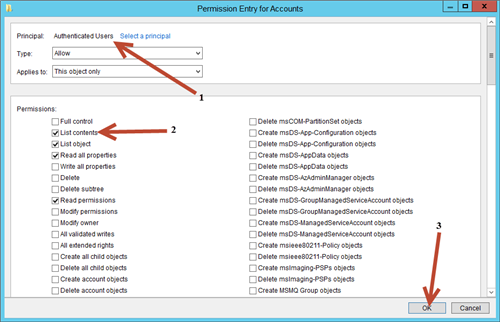 If you want to create OUs in the future and do not want the task of remembering to modify the Authenticated Users group permissions from each OU then continue on. Finally close the Schema console. Note: In the lab setup I was able to reboot the DC, you may not be able to do this immediately after you make your change.